So after my first look into David Einhorn’s long pick AerCap last week, I want to follow up with some more detailed analyis in a second step. By the way, a big “thank you” for all the qualified comments and Emails I got already after the first post, that’s the best return on investment on a blog post I can get !!! I mean you don’t have to be a genius to understand this: A company which trades near book value and compounds 20% p.a. is pretty much a no brainer. However, if I look at the developement of book values for financial companies, I always look at both, stated and tangible book value per share. This table shows two things: Before the ILFC transaction, stated book values and tangible book values were pretty much the same and compounding around 13% p.a. Still pretty good but clearly not 20%. In 2014 however, with the ILFC deal something interesting happened: The book value per share doubled but tangible book value dropped. a) why did the book value per share increase so much ? b) why did tangible book value per share actually decrease ? We have a company which has issued 100 Shares at 50 EUR book value per share and 100 EUR market value (P/B =2). So the total market value is 10.000, total book value is 5000. If the company now issues another 100 Shares at 100 EUR market value, we have 200 shares outstanding and 5000+10000 = 15.000 EUR total book value. Divided by 200 stocks we now have 75 EUR book value per share or a 50% increase in book value per share for the old shareholders. So issuing shares above book value increases book value per share automatically. 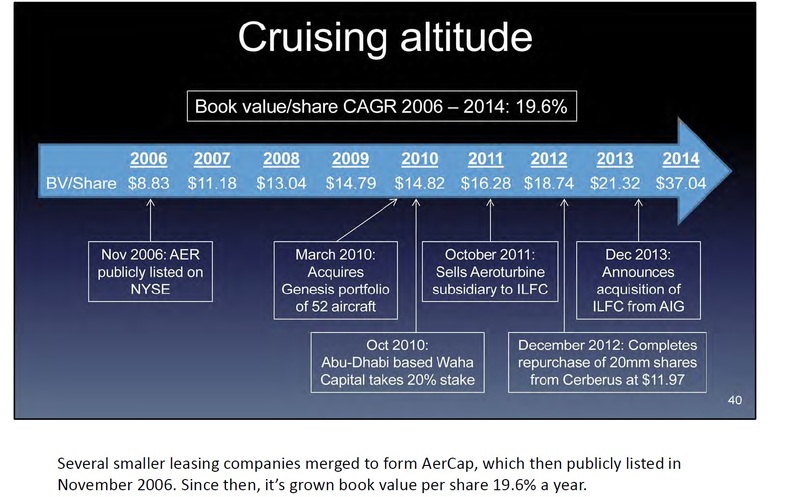 In AerCap’s case, it worked more or less the same way: AerCap had ~113 mn shares outstanding with a book value of around 21,30 USD per share. So issuing 97,56 mn share at a steep premium at 46,49 of course increased book value per share dramatically. The transaction alone would have increased the book value to ((113*21,30)+(97,56*46,49))/(113+97,56)= 32,97 USD per share or an increase of ~50%. So how is this to be interpreted ? Well, clearly it was a smart move from AerCaps management to pay with its owns shares at such a nice price. On the other hand, one should clearly not mistake this a a recurring kind of thing. I would not use the historic 20% p.a. increase in ROE as expectation for the future but rather something like 13% or so in the past. Yes, they got a lot of planes and debt. Interestingly they assumed more debt than book value of the planes. Altogether they did get a lot of intangible assets. All in, AerCap bought 4,6 bn intangibles which is around 80 mn more than equity created through the new shares. So at the end of the day, one could argue that the new shares have been exchanged more or less 1:1 against intangible assets. maintenance events performed by the lessee either through reimbursement of maintenance deposit rents held (MR contracts), or through a lessor contribution to the lessee. The maintenance rights intangible arose from the application of the acquisition method of accounting to aircraft and leases which were acquired in the ILFC Transaction, and represented the fair value of our contractual aircraft return rights under our leases at the Closing Date. The maintenance rights represented the difference between the specified maintenance return condition in our leases and the actual physical condition of our aircraft at the Closing Date. For EOL contracts, maintenance rights expense is recognized upon lease termination, to the extent the lease end cash compensation paid to us is less than the maintenance rights intangible asset. Maintenance rights expense is included in Leasing expenses in our Consolidated Income Statement. To the extent the lease end cash compensation paid to us is more than the maintenance rights intangible asset, revenue is recognized in Lease revenue in our Consolidated Income Statement, upon lease termination. For MR contracts, maintenance rights expense is recognized at the time the lessee provides us with an invoice for reimbursement relating to the cost of a qualifying maintenance event that relates to pre-acquisition usage. The lease premium represents the value of an acquired lease where the contractual rent payments are above the market rate. We amortize the lease premium on a straight-line bases over the term of the lease as a reduction of Lease revenue. This sounds quite complicated and for some reason part of the sentences seem to have been duplicated. If I understand correctly, they assume that the underlying value of the aircraft is higher than the book value of the acquired planes. To be honest: I do not have any clue if this is justified or not. However, as those intangibles are significant (more than 50% of book value), the case gets a lot less interesting for me. Intangibles created via M&A activity are in my experience always difficult, especially if it is esoteric stuff like this. It’s also a big change to the past of AerCap. Historically, they were carrying very little intangibles. (Bloomberg) — Commits due April 30 by 12pm ET. So AerCap is funding at a spread of 2,75% vs. LIBOR. With the 10 year USD LIBOR at 2,00%, funding would be way more expensive than the 3% assumed by Einhorn. Maybe the fund floating rate, but then the whole company would rather be a bet against rising interest rates than anything else. On a “like for like” basis without structural interest rate risk, I don’t think AerCap will generate a double-digit ROE at current spreads. Within the comments of the first post, some people argued that the company is not a financing company but that the access to Aircraft is the value driver. Buying cheap aircraft from manufacturers and then selling (or leasing) them with a mark-up to clients then looks like some kind of Aircraft trading business. In AerCap’s case, the biggest problem is clearly that there are not that many suppliers but only 2, Boeing and Airbus. Both don’t have much incentive to let any intermediary become too large so they will most likely encourage competition between Aircraft buyers. Secondly, as far as I understand, there is no physical distribution network etc. behind AerCap’s business. So entering the market and competing with AerCap in the future doesn’t look so difficult for anyone with access to cheap capital. Clearly, as in any opaque trading business, an extremely smart trader can always make money but it is important to understand that at least in my understanding there are no LONG TERM competitive advantages besides the purchase order flow from ILFC. That the barrier to entry the business is not that high is proven by no other than Steven Udvar-Hazy the initial founder of ILFC and his new company Air Lease. were able “to effectively steal a business,” and reap a windfall at the expense of ILFC, the world’s second-largest aircraft lessor by fleet size. It described how some employees, while still working at ILFC, downloaded confidential files and allegedly diverted deals with certain ILFC customers to Air Lease, before leaving to join that firm. The companies are in the business of buying aircraft and leasing them to commercial airlines all over the world. My problem with AerCap is the following: The financial part of the company, which I feel that I can judge to a certain extent, does not look attractive but rather risky to me. The Aircraft “buying and trading” segment on the other hand seems to be the more attractive part but for me too hard to judge in a reasonable way. So for the time being, this is clearly not an investment for me. To look further into AerCap, two things need to happen: First they need to regain their investment grade rating and funding cost will need to drop to the 3% that Einhorn is assuming and secondly, there should be a clear impact on the share price from a potential sale from AIG. In the current market environment clearly anything can happen and a multiple expansion could bring nice profits but personally, in a direct comparison I prefer the LLoyd’s case. If the debt lowers the return on assets by 3%, would the cost not be 3/0,75= 4%? They target 30% secured 70% unsecured. I would like more deleveraging than buy-back, but the market seems to like buy-backs more. I believe the decline is a function of the huge debt portion of the total EV. With less leverage the company could be a great buy here. But who knows. I think their biggest problem is the funding costs. Their 10 year CDS spread for instance “exploded” form 250 bps p.a. to 400 in the last 2 weeks. At that level, they are not competitive. As a “shadow bank” you cannot do business if you have to pay 400 bps spread. Additionally, their EM exposure is significant. Do you think AER is now a buy at under 30 (USD) or would you continue to avoid the stock? I don’t know. It’s not the type of business I would want to own right now. Steven Romick is not well known but a splendid investor and, judging by his presentations, also a very fine and humble person. He comes to the same conclusion about the aircraft leasing business but touching upon different things. Thanks for the link. I do read the FPA reports from time to time but I haven’t seen that one. I think my arguments are similar to those of David Einhorn. My ROA & ROE calculation looks very similar as well. But I cited my sources. That might be a good starting point to get a better understanding of the underlying economics of the business. I think your evaluation of the competitive environment is to simple. IATA used the 5 Forces Model to provide insights regarding the industry in “Profitability and the air transport value chain”. Furthermore I think you are overestimating the power of Boing and Airbus. AerCap is a significant customer. ILFC was an important launch customer of some recently developed airplanes. Your arguments on the ILFC transaction are very interesting. Nerver heard of the lawsuit. well, if we would have the same opinion, the stock market would be very boring…..
One additonal remark: In a “hedge fund hotel” stock you should be careful that you are not the one wh needs to switch the light off at the end…. mittlerweile tummeln sich immer mehr bei Aercap herum. Auch Leo Cooperman hat Aercap bei der letzten IRA Veranstaltung vorgestellt. Die Jungs von Profitlich haben sich auch in Q1 mit Aercap eingedeckt. MMI. Great analysis. Another problem with the aercap recommendation is the fact that there are multiple signs of oversupply of aircraft in the market. American Airlines talked about it in their most recent call and many others have pointed to it. This certainly can not be positive for an aircraft leasing company that is effectively long these assets. Unfortunately it is not in my circle of competence as I don’t know what their assets are really worth and don’t know if the related party loans are at arm’s length. In March 2015 the Group entered into the Letter of Intent in respect to sale of one Boeing 737-­‐‑000 airframe. Maybe it is worth a look for you? Was the TLB you mentioned really to finance leasing operations? I’d imagine that a secured loan against the specific collateral could, in fact, earn 3% in the current environment. I think Einhorn may be closer to the truth in regards to borrowing cost over the next 5 yrs, or so. But I don’t really disagree with anything else you’ve written! I am not sure for wht they use the TLB, I just saw that on Bloomberg. Clearly, secured financing is cheaper but it also has less flexibility. With unsecured financing, you can much more easily sell aircraft etc. For me it is also quite optimistic to assume current conditions for the future, especially regarding the significant amounts which have to be rolled each year and the new Aircraft to be purchased. 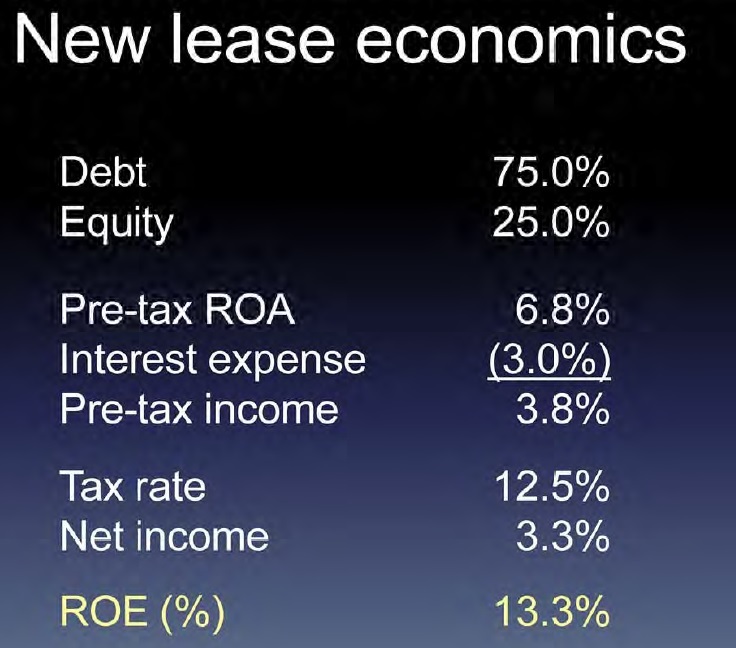 Einhorn’s new lease economics are based on income (ROA) and interest expense on his stylised capital structure of 75% debt / 25% equity. So, the assumed 3% interest actually corresponds to 4% cost of debt and 0% cost of equity. That cost of debt is in line, even above, what you say their current bonds are priced at. The intangibles point and absence of long-terms barriers to entry are still interesting. thanks for the comment. However I do not know where Einhorn takes the 25% Equity. If you look at the ILFC acquistion, the newly raised quity only financed goodwill, the actual aircraft assets were 1:1 backed by debt plus some working capital. Do you think you could share some of the lessons you learnt from those who emailed you, in detail? I am always trying to learn new things myself and would be grateful! For me it was ultimately the capital intensity that made me to not looking further on this, but it’s always great to read well-reasoned text on why not to invest in a popular idea. Also goes to show how important it’s to do ones own due diligence. I guess Einhorns idea shows how hard it is to come up with something enticing in this market.